We ran across rubber landing jack pads in Camping World and were taken aback by the prices. However, we went ahead and bought some anyway. They only had two pairs of 12 inch pads in stock, so we compromised and bought those and two more pairs of 8 inch pads. We’ve always wished we had held out for more 12 inch pads since the hydraulic landing gear pads are 8 inches around, making lining up the rubber pads a somewhat hit and miss proposition at times. Shortly after we had spent a fortune on the landing pads that we did purchase, we happened to accompany our good friends Erika and Tony Dorsey to Tractor Supply so that they could buy food for their cats. Malcolm was also in search of a jug of DEF for the truck. As we were walking in the front door, Malcolm stopped and looked at some large rubber horse stall mats and realized that the rubber in the mats wasn’t much different than the rubber in our landing pads. We filed that away for future reference. Fast-forward to today and we decided to take the plunge. We stopped by the local Tractor Supply and picked up a horse stall mat and 100 feet of nylon cord. 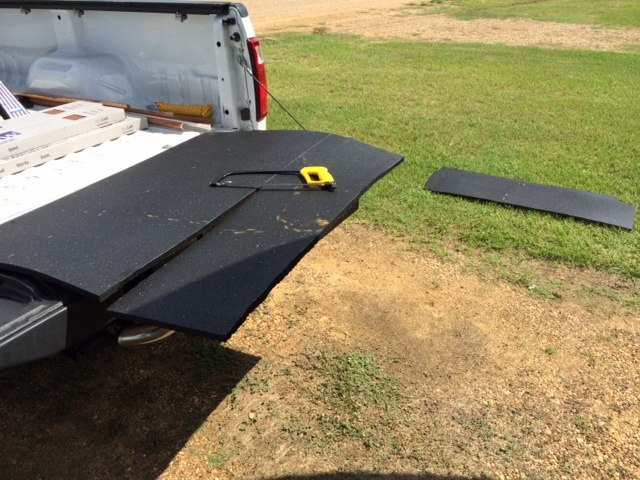 Once back at the campground, Malcolm set to work in cutting the mat into six 1′ wide strips. He found that the circular saw didn’t like cutting rubber. It did it, but grudgingly and making a lot of burnt rubber smell in the process. A different blade may have made the difference, but Malcolm set the circular saw aside once the battery needed charging. Pulling his hacksaw out of the trailer, he found that it sliced through the rubber rather handily, though it tended to sometimes leave a rougher edge. With six 4-foot by 1-foot strips cut, it was time to start cutting one of the strips into four pads (12″ x 12″). 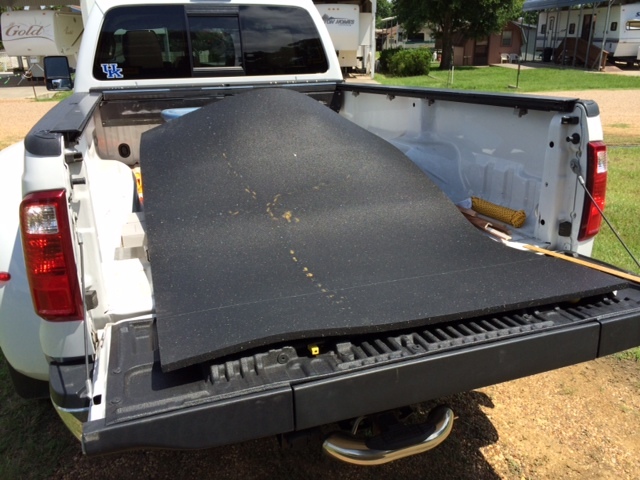 The other five strips went into the front of the pickup bed for later processing (it was extremely hot and humid outside and we only needed four more pads for now). Once the four foot strip was cut into 4 one-foot squares, it was time to assemble additional tools. A pair of wire cutters was used to snip the rope into approximately 28″ lengths. A butane torch that we happened to have on board was used to melt the ends to keep them from fraying (a butane lighter or match would suffice). 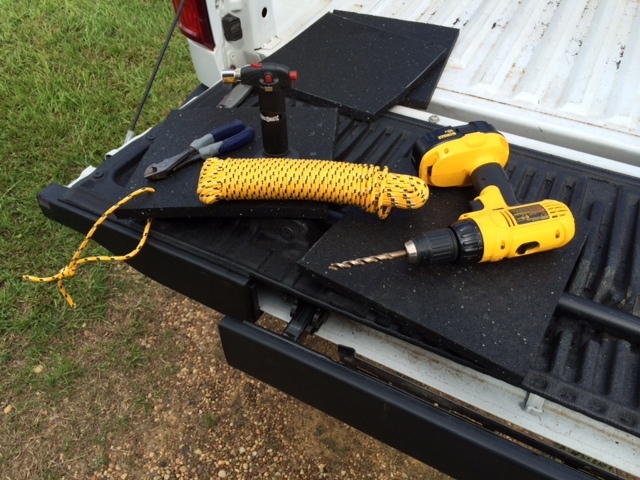 A 3/8″ drill bit was used to drill a hole near one of the corners of each mat. We’ll see how these hold up long-term. If nothing else, we have enough material to make 20 more pads. For reference, the current (sale) price for a pair of 11.5″ x 11.5″ mats like we purchased at Camping World is $47.77, or about $24 a pad. We took your advice today and after church and eating lunch we stopped by Tractor Supply and bought a 4 x 6 horse pad and ploy rope. 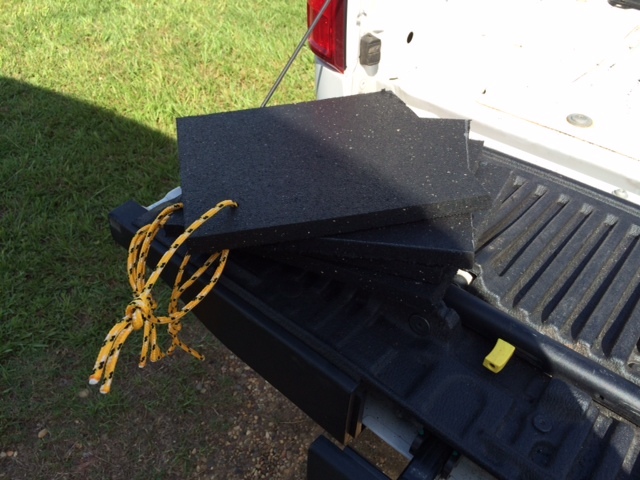 Started out using the hack saw and then decided to use the circular saw…..a little tough but we got thru the mat and made 6 – 12″ pads and drilled holes for the rope. We will use them over the 4th as we are camping at Lake Lanier just north of Atlanta. Thanks for the post on the pads and we like you floor job too, however, we do not need to do that just yet! Keep all this good stuff coming. Thanks again and hope to see you and Val at another rally soon.